Eddi - A Thought Leader Klout of 60! Klout is a service that, in theory, measures your influence on the web. Anyone who has a Facebook or Twitter account can sign up. Just go to the Klout web site. I did not sign up for Klout. I was sent an email telling me that my KLOUT (your score is your KLOUT) was 42. This is a good number. 60 is a very high number. In fact, as far as I can tell, only Hamlet Au, the editor of Second Life uberblog New World Notes, has a higher KLOUT of Second Life influential people. His is 63. Note that this Klout score is for Eddi Haskell, my Second Life main avatar. My real life Klout score (I have not checked) is definitely not this high. Eddi beat out Phil Rosedale, the founder of Linden Lab. Phils Klout is only 58. According to KLOUT, Eddi is more influential in Second Life than Phil! Who knew? Now, before all of you think that I am bragging I am not. I am actually highly amused by all of this.And i will give you some reasons why, at least in my case, it does not make much sense. According to the chart on the top of this article, Facebook is where I am getting much of my KLOUT from. The thing is this -- I really do not spend much time there. I do have over 1300 friends. What I have done in order to get my Klout score up is to send a friends request in Facebook to anyone I have alt least 10 friends in common with. I added over 1,000 friends in six weeks this way. I did not know that this type of activity is frowned upon by Facebook. I got an email telling me that there were complaints about this, and I should not send friend requests to people I do not know. Live and learn! Now, why do I think Klout is strange? If i have any influence at all on the web, it is my blog -- what you are reading now. I interact with over 1,000 people a day through this. Yes, as far as I can tell, Klout does not count my blog at all when measuring my influence in social media -- perhaps because a blog is not really social media, but a one to many relatively non-interactive publishing mechanism. I am proud of you Eddi! 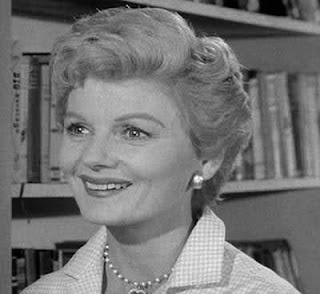 Barbara Billingsley as June Cleaver. One of the benefits of Klout is supposed to be "Perks", things like free trips to Seattle, free washer/dryers, and other wonderful gifts to people who have scores over 50. To date, I have not received one Perk. My guess is that since Eddi only exists in Cyberspace, people are going to check before they give him something of value to see if he really exists. However, if they offer Eddi something, I will try to take it and explain that the real life me is really Eddi! I can see the van with the straight jacket arriving here about four hours later! To get my KLOUT score up, all I have to do it seems is to post more on Twitter -- something I have not bothered to do. My Twitter is merely a link to my blog posts, and my readership is limited. I am sure I can jig something up that makes my Twitter posts look as if they were written for Twitter, and not simply reposted. But I am not going to do this -- I have better things to do than to get Eddi's KLOUT score up. Klout does "tweak" your score quite often to get your interest up. What they do is jump" to a higher score, and then slowly take it away until they "jump" it up again. Their hope is that you get addicted to checking your score out, and generate interest and web site hits for them. I have to admit, its worked for me. All these rating sites make me vomit. It's all just a big fake popularity contest and nothing to do with content. I just hope I can get some free perks!